It’s a festive time of year for Asian Americans. As many readers know, the Lunar New Year celebration kicked off last week, and I hear that in China, the celebration lasts a good deal more than 1 day due to the mass migrations that occur for work-related reasons. For example, last year a PBS documentary called “Last Train Home” focused on the journeys of Chinese workers who often leave their rural villages to travel hundreds of miles for work and return on holidays with their earnings. he notes that the most often stated strategy for dealing with religious difference between spouses was not to talk things out and compromise. Rather it was to not talk about it at all. 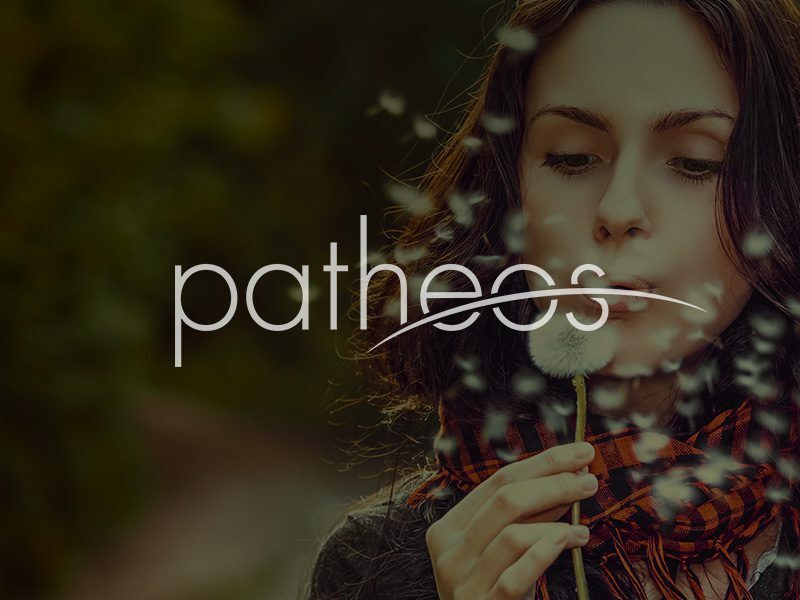 Couples who have the most direct access to the worldview and practices of another faith often fail to connect on the spiritual. 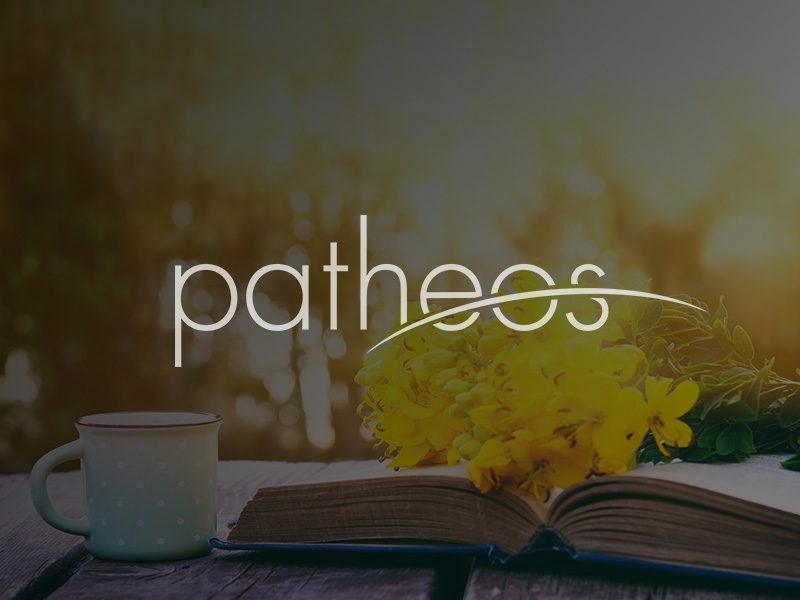 Indeed author Naomi Schaefer Riley’s new book discusses this in greater detail in her interviews with married and divorced interfaith men and women. The differences are noticeable. 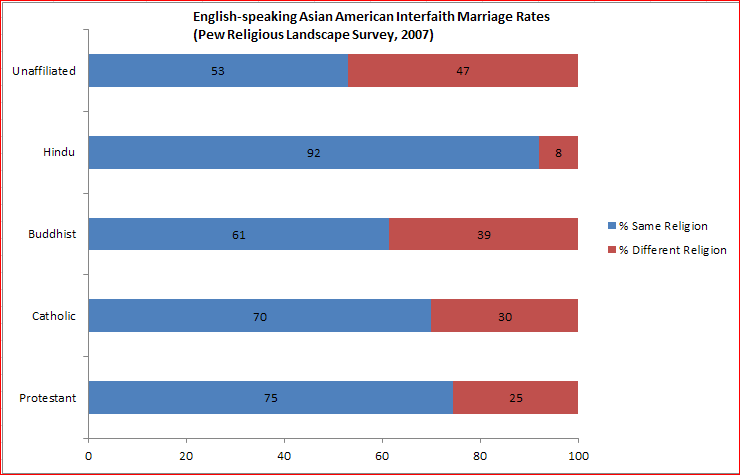 In the Figure to the left, about 25% of English-proficient (EP) Asian American Protestants in 2007 were married to someone of a different faith, whereas in the figure just below, 19% of Asian Americans (accounting for possible LEP individuals) were interreligiously married or in partnership. While 30% of English-speaking Asian American Catholics were in an interfaith relationship 19% of Asian Americans (accounting for LEP) were so. This represents the biggest gap between the two surveys for respondents of Asian American background. 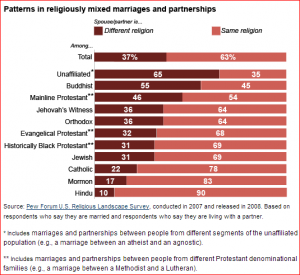 The one consistent pattern is Hindu interfaith marriages. A modest 2% difference appears between EP Asian American Hindus and a broader LEP-accessible sample of Hindu Asian Americans. 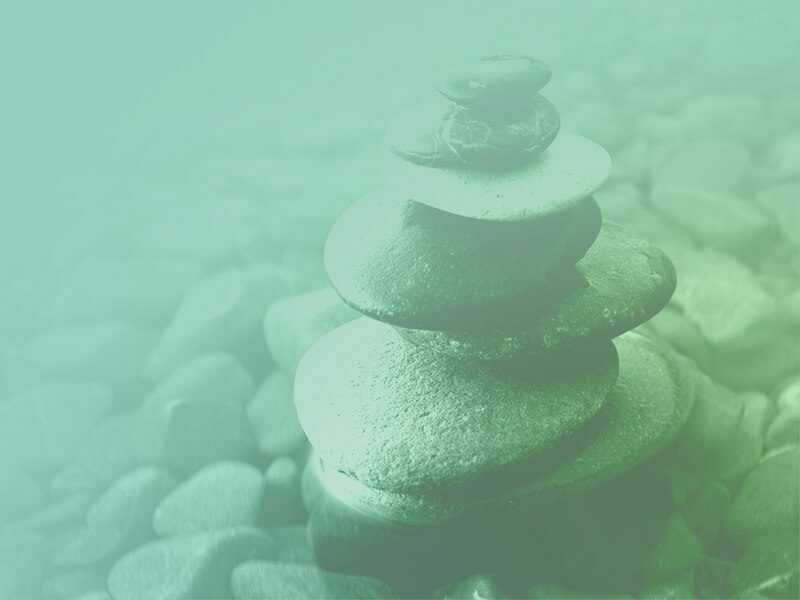 Notably regardless of survey, Asian American Buddhists had the highest rate of interfaith marriage compared to Catholics, Hindus, and Protestants. 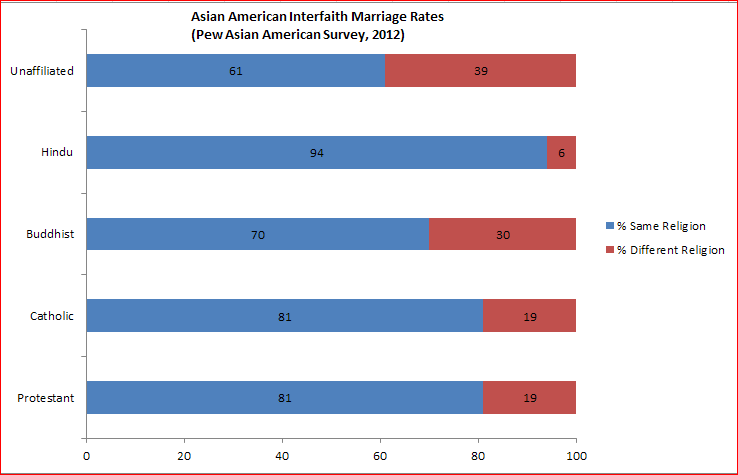 This pattern of greater interfaith marriage among EP Asian Americans makes sense when we apply sociological theories of assimilation to explain the difference between the two surveys. 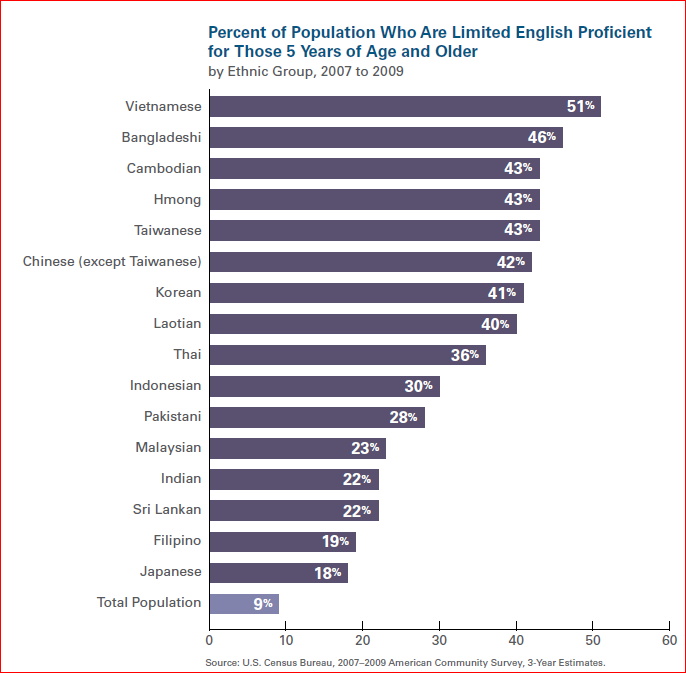 For Asian Americans, perhaps with the exception of Asian Indians, English ability is a function of length of residence (if one is an immigrant, like 59% of Asian Americans ) or simply growing up in the US. If one is more acculturated, religious fidelity likely weakens in the aggregate. So we would expect that a survey of English-proficient Asian Americans will usually show a higher rate of interfaith marriage compared to a sample that includes LEP respondents. Intriguing also is the notable difference between the general population results and the Asian American sample (just compare the top graph with the ones below). EP Protestant Asian Americans are less intermarried compared to American Protestants in general (30% compared to 32-46%). Most dramatically, 65% of unaffiliated Americans are in a mixed marriage, but only 47% of EP Asian American nonaffiliates are. Further, while 55% of American Buddhists are in an interfaith relationship, only 39% of EP Asian American Buddhists are in mixed marriages. This is now a second illustration of the sociological difference between Asian and non-Asian Buddhists in the US which we learn through improved survey methods. Previously I noted that the white Buddhist population is more like 25-30% of all Buddhists in the US, and not 53% as the RLS shows. The one remaining curiosity left unexplained is Catholic EP Asian Americans. While 22% of American Catholics are in an interfaith relationship, 30% of Catholic EP Asian Americans are. Using the assimilation framework we would expect the rate to be a good deal higher for non-Asian Catholics. Latinos do make up a substantial minority but I don’t think they are big enough to sway the figures we see. So I ask: why are assimilated Asian American Catholics in interfaith relationships more so than their American peers overall? Send your speculations! In short, this season has ushered in some time to reflect on relationships, mixed-religious marriage being one form of it. 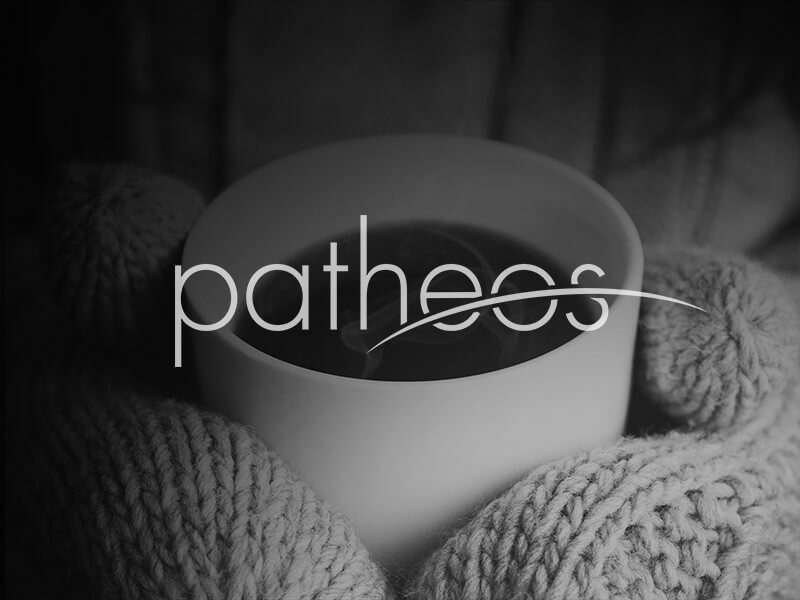 In the American context, these marriages theoretically hold much promise, but often fall short of realizing those ideals of mutual understanding and growth. Asian Americans play a big part in the interfaith marriage world given the large presence of non-Christian religions among them (which we can verify with better survey tools). Figuring out how to make interfaith marriages work is perhaps a more noticeable issue among Asian Americans than other groups; perhaps the stories of thriving relationships will emerge from them in the years to come. Happy (belated) Year of the Snake! Does Christianity, Like Not Eating a Marshmallow, Make You More Successful in Life? I never thought about this issue. Thanks Dr. Park for some stimulating thought. Thanks for your work. I will be looking forward to more. Asians seem grossly overlooked in many sociology contexts. We see more interest in the thoughts and behaviors of proportionally much smaller groups. There also seems to be a sort of tendency to just ignore Asians even in those contexts where they aren’t a small fraction. For example, the Univ. of Virginia marriage project which produces The State of our Unions seems to think Asians don’t exist. In last year’s report, they investigated trends and differences among married college graduates, a group among which Asians are a huge fraction, yet they didn’t discuss them at all. Very strange.